I call this a “freestyle” dish because I tossed aside the original recipe and began adding my own ingredients as I went along. I’ll credit listening to the dance version of Oye Come Va for helping me think of the Spanish influenced ingredients that ultimately turned this little number into a tasty Mexican style dish! Real easy to make...give it a try! Cook potatoes in a large saucepan of boiling water until fork tender, about 15 minutes. Drain potatoes. Using a potato masher, mash potatoes while gradually adding some milk. Beat until potatoes are light, fluffy and no lumps remain. Season with salt and pepper. In a large skillet, cook beef, onions, green peppers and corn over medium-high heat until meat is no longer pink. Add garlic and cook for 1 minute more. Remove skillet from heat and add, salsa, green chilies, salt and pepper. 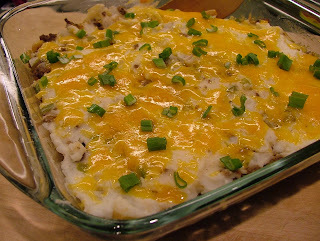 Spoon mixture into a casserole dish and spread mashed potatoes on top. Sprinkle with cheese and bake in a 350º F for 10 minutes. Sprinkle green onions on top and serve.